Add another layer of security by receiving a text message notification anytime your Mango Card is swiped. With wireless alerts it’s easy to keep track of your budget by getting you your Mango Card balance after every purchase. Did you give out your Mango Card to set up a recurring payment? Wireless alerts is a great way to know when and what comes out of your Mango Card. The best part is, we don’t charge customers for wireless alerts*. *Your mobile carrier (not Mango) may charge a fee to receive text messages. 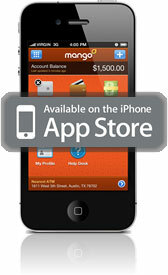 You can now manage your Mango account directly from your iPhone. View your Mango Virtual Card. YAP mobile payments is part of your Mango account and it makes it easy and convenient to securely transfer money to another Mango Cardholder by sending a simple text message. Need to split a bill? A family member is short on cash? With YAP you can send money with the push of a button. YAP also allows you to check your Mango prepaid and Mango Savings balances with a text message. 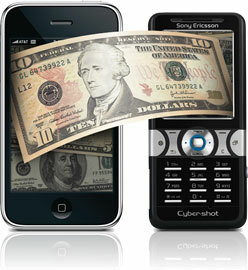 You can use any US mobile phone via SMS or download the Mango Money application from the Apple app store. 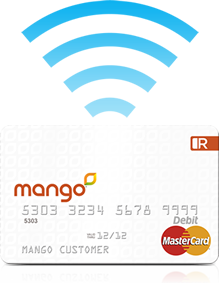 The Mango prepaid card and savings accounts are issued by Inter National Bank, member FDIC, pursuant to a license from MasterCard International, Inc. Additional services are provided by Rev North America, Inc. Use of the Card is subject to funds availability. Fees, terms and conditions apply. See the Cardholder Agreement for details. All trademarks, service marks and registered marks are the properties of their respective owners. †Interest is calculated on the average daily balance of your Savings Account and paid monthly. Annual Percentage Yield (“APY”) and the APY comparison as advertised are accurate as of October 1, 2011. The APY advertised applies only to the portion of your Savings Account balance which is $5,000.00 or less. An APY of 0.10% will be paid on the portion of your Savings Account balance which exceeds $5,000.00. Fees may reduce the earnings on your Savings Account. This is a promotional rate and is subject to change without notice. A minimum of $1.00 is necessary to open your Savings Account. A limit may be placed on the maximum amount of funds you can deposit into your account. This limit may be exceeded by interest accruing on the funds. The limit may be changed from time to time. * Certain mobile carriers may not support YAP functions. Once you enroll in Mango, you may opt-out of YAP by texting the word “STOP” to 88988. This will block you from sending and receiving any mobile messages from YAP but will not affect your Mango Account.